Discover the Wonders of Parisian Sightseeing Today! Explore Paris’ most Spectacular Destinations for Less! 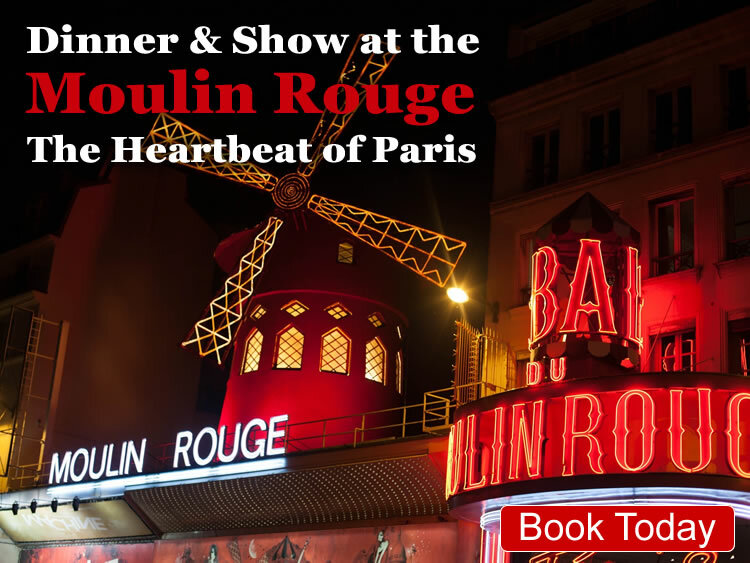 Moulin Rouge – The most famous cabaret show in Paris! Take a trip to Paris and explore the sights! LOVE the City of Lights for Less with the biggest and best selection of savings you'll find online. Discount Paris is your one stop shop for Tourist Attractions, Sightseeing Tours and Seine River Cruises in Paris. No matter what you're looking for, we're here to help. Take advantage of our huge array of package deals that let you explore Paris at your leisure. Visit when you want, how you want, and save a bundle on tickets for all of Paris' top attractions including the Eiffel Tower, Notre Dame, Louvre Museum, and famous Royal Palaces. See the real Paris with great offers on sightseeing tours, from classic open top bus tours to insightful themed trips that embrace all the quirks and charms of the capital. Alternatively, set out through the heart of the city on a Seine river cruise that showcases the capital's landmarks from a truly unique vantage point. For our ultimate savings, don't forget to check out our money saving packages - there's something for the whole family!